If you went to such a school back then I recommend you google the following – Absolute beginnings Stuart Hall – up comes a paper at the very top of the page that discusses secondary modern education in the 50s, the spending patterns of the teenagers back then and much more. Even grammar school pupils will get something from it. The first St.Joseph’s Roman Catholic Church (Click to VIEW) was established in Ushaw Moor and opened on December 19th 1909. It was a corrugated iron structure and cost £474. Father Beech and his curate, Michael Shelley, were the priests responsible, travelling from Newhouse on horseback or by train, for the first two years. The first baptism took place on January 16th 1910, the infant being named Thomas Nugent, and the first marriage took place on April 15th 1911 between Matthew Rutter and Edith Webster of New Brancepeth. Attendances at Mass were averaging 320 with 203 at Benediction. In December 1911 Father Shelley came to live in Durham Road where a house was built which accommodated the priest until 1931 when a new presbytery was erected with the new church. On May 23rd 1925 Ushaw Moor became an independent parish consisting of Ushaw Moor, Broompark and New Brancepeth. Bearpark came into the parish in 1935. On June 19th 193O Bishop Thorman laid the foundation stone for a new, church. Most of the ground clearing and digging of foundations was carried out by parishioners. The bell for the new building was given by the people of Ballingarry, County Tipperary. Almost a year later on April 21st 1931, the new St. Joseph’s Church was opened by Bishop Joseph Thorman, with the first marriage ceremony taking place four days later between William Regan and Imelda Cairns and the first baptism being performed on Eileen Veronica Illand on April 26th. After seven years the church was free of debt and on 17th May 1938 Bishop McCormack performed the ceremony of consecration. The following year, as a result of war being declared, children from high risk areas were evacuated and St. Joseph’s welcomed children from St. Wilfred’s, Gateshead and St. Philip’s, Dunston. At the evacuation of the troops from Dunkirk the school and hall were taken over to accommodate the soldiers. On April 22nd 1946 Michael Shelley, the well-loved parish priest, died. A short while previously he had been created a canon of the diocese. His thirty-seven years of dedication having seen many changes in the mining community who were greatly influenced by his presence. Father Whitaker succeeded Canon Shelley and under his guidance the Sanctuary was altered in 1955. Shortly after it’s completion he died on April 7th, 1956. The third parish priest to be appointed was Father L.V. Thompson. A new hall was built on the foundations of the old church and was opened on 21st July 1979. The Baptist Church at Ushaw Moor Colliery was formed in 1881. It’s first meetings were held in a hut which was loaned by the colliery company. This building which was poorly lit and badly ventilated, was probably one of the structures erected to house the first workmen. It is recorded that at that time preaching became dangerous and, if one remembers that this was the year the strike took place at Ushaw Moor, it can be realised that many of the community were in no mood to accept teachings of compassion and non-aggression. The little group held together however, and particularly remembered was a little Welshman, David Price, and his wife who stuck to their convictions even though they were contrary to the spirit of the striking miners. In 1894 Pease & Partners, the new colliery owners, were approached for help. They granted land some distance from the mine, in the expanding village of Ushaw Moor, and in addition gave building materials. This church was completed by 1897 at a cost of £700 (Click TO VIEW). The Sunday School room was added in 1925 and dedicated to the Esh Winning pioneer, Mr. John Raw. Robert Dixon, who was employed as a winderman at Ushaw Colliery, is remembered as a Sunday School superintendent of many years standing, along with Mrs. Henderson who was it’s secretary. So we have a new rating system for our postings on Ushaw Moor Facebook. [Stop press: see comment 1] The challenge is a little daunting: will spelling errors be crucified or the absence of semi-colons be treated with unbelievable scorn? Will ‘Grumpy Man’ be persecuted for the crime of irrelevance? I can feel myself working up a lather; my tonsils are twitching and my heart is banging like it was 1981. Of course the answer to all of the above questions is no. Well, hopefully. We live in a perpetual state of hope. So chill and deliver. Never mind the punctuation, just sing like a sweetly tuned nightingale; let the heart rule the head and bring back those balmy days of bluebell woods, potato picking for cash and dancing at the hop in bright orange or yellow socks. Is the bacon to your liking sir? Probably the most outstanding person working at Ushaw moor colliery was Jack Joyce. 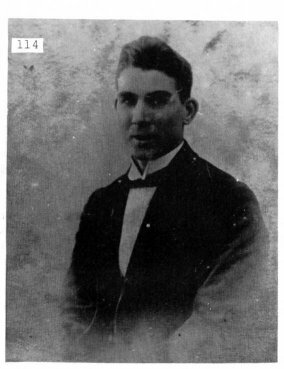 He was born at Spennymoor in 1892 and began work at the age of 13 in 1905 spending his whole working life at the same mine. In 1946 he was elected financial secretary of the Durham Miners Association. Being a forceful union official he represented the miners as checkweighman and compensation secretary. From 1924 until 1945 he was a member of Lanchester and Durham Rural District Councils. Before his death in 1967 he had the pleasure of seeing his portrait painted on the last Ushaw Moor colliery banner in honour of his work for the Ushaw Moor community. via Ushaw Moor Historical Website – Jack Joyce. This photograph was taken between the years 1928- 1933, when carnivals were held at Ushaw Moor. At these carnivals local people were in fancy dress and later in the day a King, Queen and Mayor were picked. Top from left Town Cryer T. Conner; The King Jimmy Winn; The Queen Nick Tennick; The Mayor Jack Joyce. 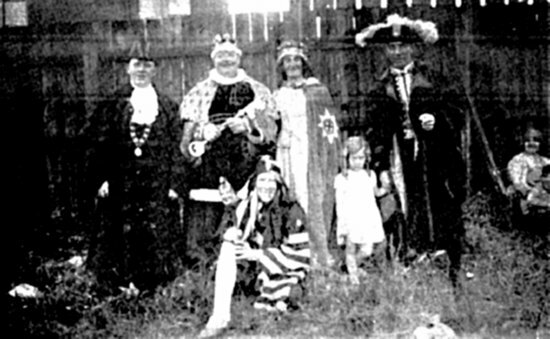 Bottom from left The Joker T. Foster; Little Girl Daughter of Jack Joyce. 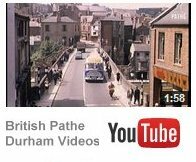 via Ushaw Moor Historical Website – Ushaw Moor Carnival.